As the need for aid in Haiti persists, local individuals and groups continue to mobilize. UJA Federation of Northern New Jersey is still accepting donations for The Haiti Earthquake Relief Fund. All monies are sent directly to the American Jewish Joint Distribution Committee. As of Tuesday, the group had raised $123,676. Send donations through the UJA-NNJ Website, www.ujannj.org/Haiti, or by mail. Teaneck resident and Judaic artist Deborah Ugoretz reports that her studio-mates have organized a fund-raising event entitled Small Works for a Big Cause: Artists Unite to Help Haiti. Organizers are asking people not only to attend the exhibit/sale but, if possible, to contribute a small piece of art. The event will take place on Jan. 31 from 2 p.m. to 5 p.m. at BrassWorks, 105 Grove St. in Montclair. According to Ugoretz, the group seeks 2-D works, no larger than 12″ on any side, and works will be sold for a suggested $50 minimum donation. All proceeds will go to Haiti earthquake relief organizations. Those interested in donating their artwork should send an e-mail to monabrody@mac.com. Combine the opportunity to raise money for Haiti with Zumba, the Latin-inspired dance fitness phenomenon, at “Zumba for Haiti” at the Bergen County YJCC on Feb. 21 from 12 noon to 1:15 p.m. Minimum donation is $18, payable to UJA-NNJ and designated for its earthquake relief fund. Zumba will be led by Missy Avalo, with guest instructors Shelley Capener and Anna Alon. The YJCC is at 605 Pascack Road, Township of Washington. For more information, call (201) 666-6610, ext. 291. Northeast Podiatry Group and the Fair Lawn Jewish Center/Congregation Bnai Israel are collecting emergency medical supplies for Haiti’s burn and orthopedic trauma victims. Their goal is to fill a tractor-trailer with donations of medical supplies or used orthopedic equipment. The nearest drop-off point is the Jewish Center, at 10-10 Norma Ave. in Fair Lawn. For more information, send an e-mail to jenni@burnadvocates.org or visit www.burnadvocates.org. Donors can also choose to contribute money to help defray shipping and distribution. From left, Maria Pineda, Damary Collado, Eve Domercant, and Carlos Sanchez. Former Englewood Mayor Michael Wildes has asked that those who want to donate material goods to the people of Haiti bring new or gently used clothing and baby supplies in plastic bags to his home at 250 Allison Court in Englewood. Wildes also urges people to contribute to the American Red Cross International Response Fund for Haitian Relief (www.redcross.org). Twin brothers Seth and Philip Aronson will perform at Hamsa restaurant, 7 West Railroad Ave., in Tenafly on Wednesday, Feb. 3 from 8 p.m. to 10 p.m. Admission is $10 at the door. All proceeds will be donated toward Haitian relief efforts. The duo, dubbed the Aronson Twins, grew up in Tenafly and now live in Closter with their families. In addition to writing and arranging their own songs, they frequently perform in the New York area. The Ramaz school in Manhattan reports that the school is collecting money to distribute to both the American Joint Distribution Committee (JDC) and the American Jewish World Service. In addition, some classes set aside time to recite tehillim, psalms, on behalf of the victims. The school held a special assembly during which students were educated about the tragedy and suggestions were made as to how students might help. 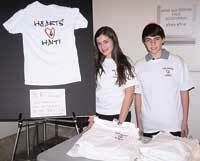 Subsequently, a middle school student produced T-shirts reading “Hearts 4 Haiti” and will donate proceeds from sales to the JDC. An upper school program included the reading of a prayer specially composed by British Chief Rabbi Sir Jonathan Sacks to mark the tragedy. The school is also organizing relief efforts including food and clothing collections. Palisades Medical Center staff members helped organize a medical mission and donation of medical supplies that will be delivered to Jimani on the Dominican Republic/Haitian border, to aid the victims of the earthquake. The donation will be brought to Jimani by representatives from Guardians of Healing and the Haitian-American Charitable Alliance, which scheduled medical missions for Jan. 31 through Feb. 7, and later in March. The Palisades Medical Center donation includes splints, bandages, surgical gowns, and other medical supplies and equipment.